SIR ALEXANDER MACKENZIE'S Liberal administration was the first to recommend, in 1876, abolishing Canadian appeals to the Privy Council in London, England. But the proposal did not survive the criticism of Sir John A. Macdonald, then Leader of the Opposition. 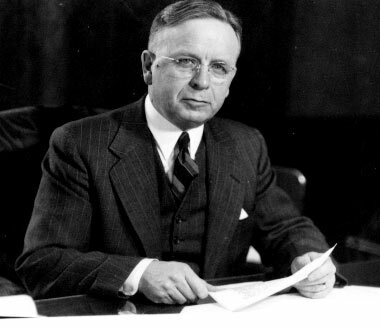 Stuart Sinclair Garson (pictured, circa 1949), was a former Premier of Manitoba (1943-1948), the very province which had successfully availed itself, in 1892 and again in 1895, of the Privy Council appeal process to shed the obligations upheld by the Supreme Court of Canada with regards to the Manitoba school question. Garson additionally benefited from a decade of private law practice in Ashern, Manitoba, and Ottawa. On Tuesday, September 20, 1949, when the Minister of Justice introduced his legislative measure, debate quickly turned into an intensive partisan constitutional debate, the Conservatives expressing their traditional defense of provincial jurisdictions. The bill called for the federal government to select the judges of the Supreme Court and eliminating recourse to an "unbiased" British Court. Time had come to sever this lingering umbilical cord. STUART S. GARSON - Minister of Justice (Marquette): Mr. Speaker, I would like to move the second reading of Bill No. 2, To Amend the Supreme Court Act. Canada has retained two badges of colonialism. The first is that we must petition the United Kingdom parliament to pass a United Kingdom statute which alone can amend our Canadian constitution. The second is that the ultimate determination of Canadian statute and other laws is the responsibility of the judicial committee of the Privy Council, a United Kingdom court. The bill which is now before us will strip off the second of these badges by abolishing appeals to the Privy Council. In that sense it represents an important step towards complete nationhood for our country, to create in the Supreme Court of Canada exclusive, ultimate appellate civil and criminal jurisdiction within and for Canada and by abolishing appeals to the Privy Council and by making the judgments of the Supreme Court final and conclusive in all cases. From now on the only impediment to our governing ourselves fully and completely is our own inability to agree among ourselves, first, whether we should do so, and, if so, how we should do so. That, I suggest, is an intellectual and moral impediment which exists in the minds and character of our public men and citizens. It is not a legal impediment which needs to continue to exist in our constitution. Canada in almost every other respect - political, financially, economically; in the realm of foreign affairs; in both her primary and secondary production; in her trade and commerce; in her assistance to less fortunate nations; in her armed support of freedom and peace - has attained a complete and honourable nationhood. The question is whether it is consistent with that nationhood that we should continue an arrangement with regard to the hearing of our law cases which was begun in colonial times and still preserves its colonial characteristics. Surely, Mr. Speaker, we have here a country which from the beginning has had many qualities of greatness, which is more united, magnanimous and powerful today than it has ever been, and whose resources and possibilities seem to require only that we should ourselves act as the citizens of a great country to make our Canada achieve the destiny of which she is capable. We, the citizens of such a country, should not ask those of another, even though they be of our own blood, to decide our lawsuits for us, interpret for us the laws which we pass here, and provide amendments to our constitution at our request when we need them. If in smallness of mind and meanness of spirit we needlessly perpetuate such a situation, we are unworthy of the efforts and sacrifices of our fellow-Canadians, and undeserving of the bounty which Providence has bestowed upon our country. GEORGE A. DREW - Leader of the Opposition (Carleton): Mr. Speaker, something more is involved than the question of appeals to the Supreme Court of Canada. Before the provincial governments are told how their constitutional position will be interpreted it would seem highly desirable that they be consulted as to the procedure by which this will be done, as to the kind of tribunal which would meet their desires, and as to the authority of that tribunal to interpret the constitution. There are many who sincerely believe that it would be infinitely better if the powers of the provincial government were limited, and that this country could be more efficiently governed if there were one single government having full authority over the whole of Canada. There are others who do not hold that view, but who nevertheless seem to be unaware of the extent to which that division of authority can be whittled down by apparently innocent extensions of central authority which, step by step, might produce a fully centralized government, in fact if not by name. The question of appeal in constitutional matters is part and parcel of our whole constitutional structure. It cannot be separated. The constitution itself is the supreme law. But along with that goes the tribunal that will interpret the law. There must be understanding that the tribunal will protect and preserve the rights of all parties themselves who live under the guidance and jurisdiction of those governments. I move that the words "this day six months" be added to the question. RIGHT HON. LOUIS S. ST. LAURENT - Prime Minister (Quebec East): I congratulate the Leader of the Opposition. Of course I must at once disappoint his hopes that the government would accept a six month hoist of this bill. People inhabiting the provinces are represented by the members they elect to sit and vote for them in this House of Commons. Not less than ten times from 1871 to 1949, amendments to the constitution have been proposed and made without consultation with the provincial governments or the members of the provincial legislatures. We have no right to recognize that the provincial governments have any control whatsoever over these matters of public interest and national sovereignty allocated to the federal authority. When there is a contest, the Supreme Court of Canada will have the function of deciding which contestant is in the right and which contestant is in the wrong, not by creating new law but by applying the law as it exists. I do not think there is a country in the world in which there is greater respect for the courts of justice, then here in Canada. We lawyers feel a special concern about the courts. It is my belief that we shall find we have something of substantial value to the profession of law in leaving to Canadian lawyers, elevated in due course to the high office of His Majesty's judges of his Supreme Court of Canada, the responsibility for the final decision on Canadian cases. In the final analysis, the three major parties in the House supported the principle of the bill. Third Reading division was somewhat marred by a last minute manoeuvre by Thomas Church, the Conservative member for Broadview, known for his devotion to all things British. Just as the Speaker called the vote on Third Reading, Church desperately moved for a six-month hoist of the proposed legislation. Unfortunately, he was not able to find a seconder and the Speaker declared the Third Reading motion carried. The House quickly went on to the next item on the order paper amidst muffled cries from Church: "you may railroad it through," he bellowed, "but I can tell you that there will be an appeal." There never was another one to the Judicial Committee of the Privy Council of another nation. See also A Supreme Court for Canada: Act One (1869).